The tallest rack you can put in it is 20 feet. Typically you don’t measure all the way to the ceiling in this exercise – you measure to “clear ceiling height”, which is the distance from the floor to the level of the lowest obstruction, such as light fixtures, ducts, or sprinklers. For the sake of this exercise, your clear ceiling height is 24 feet. In any real world scenario this would be broken down more extensively, but for example’s sake it is close enough. To calculate the total cubic storage volume currently being used. If racks aren’t tall enough to take advantage of the full clear ceiling height (24′ in this example), that is considered unused cubic space. Calculate this for all reasonable storage areas. Count storage areas where shorter storage equipment, such as shelving or carton flow racks are being used, since those in theory are part of your storage cube. In this example, we’ll say that 8,000 square feet isn’t part of the storage cube (8,000 * 24 = 192,000 cubic feet). Subtract 192,000 from 720,000. This leaves you with 528,000 cubic feet of potential storage space. Then, divide the building cube (720,000) into the storage cube (528,000). This gives us a 26.6% ratio, which is in line with industry average of 22-27% cube utilization. This is a standardized average, and is not meant to truly measure the space utilization of a building. It’s useful to understand the potential storage of a facility as if you are considering moving into a new building or revamping a current one. High density storage such as pushback racks, pallet flow, drive in racks, carousels or vertical lift modules can help increase storage density if you have the unused cubic feet. If your ratio is less than 22%, you may be able to revamp storage easier than you could making a move or adding on warehouse space. What types of storage racks are being used? Make sure they fit the product you’re storing in them. Generally you should place slower movers (more here) in shelving or bulk racks and faster movers in carton flow or pallet flow racks. Don’t get dogmatic about this – there are often good reasons for you to be flexible. Are you taking full advantage of the vertical cube? 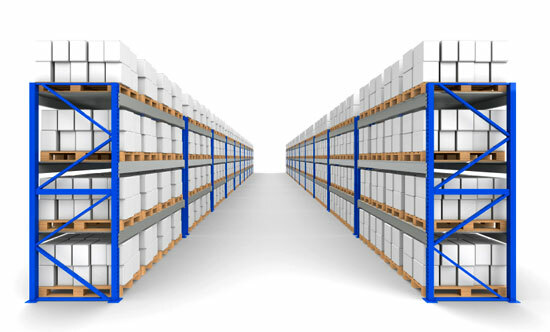 Are you using more racks rather than taller ones, or high density solutions like pallet flow or drive in racking? Is “honeycombing” occurring in the facility? (Honeycombing occurs when pallets are retrieved last-in, first-out. This creates voids in the warehouse that can’t be filled until an entire lane is emptied). How many places? How often? Note that pushback or double deep racks can create this effect, and in the right situation, it’s acceptable. Are your pick paths optimized? Whether you utilize a classic “cantilever” pattern (racks/shelving extended from a central conveyor line or main cart path), a serpentine path scheme (can help reduce the length of the pick path), or other layouts, calculate their efficiency based on your current order and picking profile. Sometimes, companies sacrifice picking path efficiency for storage density. Saving space isn’t worth it when it compromises the picking speed and ergonomics of the operation. How popular is the item being stored? What’s its pick rate? Your fastest-moving inventory should be kept at the shortest path and optimum ergonomic height. What are the item’s physical characteristics? Sometimes the mistake is made of assuming bulkier items should be kept in static storage equipment, rather than dynamic storage (like flow storage or carousels). It really depends on the item’s popularity, weight, and the pick paths you’re using. Don’t put it in less accessible places simply because it’s larger and easier to pick. See “Tactics to reduce small parts picking errors” for more on component picking. What could be stored more appropriately? Could it be stored more space-efficiently using higher density solutions rather than selective racks or shelves? What can be eliminated? Are some items “dead” inventory? How long are they stored? Every cube can be maximized, but the balancing act is this: the higher density the storage, the less accessible the product. These are the trade-off’s we must consider. (See more “Storage Density vs. Selectivity”).